Hamantaschen - Kosher In The Kitch! 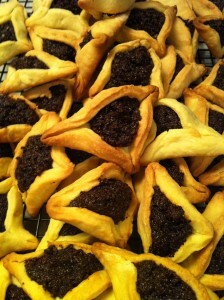 Hamantaschen - Kosher In The Kitch! Use the traditional fillings of mohn, apricot and prune or use your favorite flavors of preserves. Combine dry ingredients in bowl of processor. Pulse processor three or four times. Cut margarine into tablespoons and add to flour mixture. Pulse several times until mixture resembles small crumbs. Beat egg with vanilla and two tablespoons water. Turn on processor and pour liquid through feeding tube. Dough will form in less than a minute. Add one tablespoon more water if mixture seems too dry. Scrape dough onto a sheet of waxed paper Wrap well and chill several hours or up to two weeks. Allow dough to return to room temperature before rolling. Cover cookie sheets with parchment. Preheat oven to: 375 F. Sprinkle flour on a flat surface. Divide dough in thirds. Take one portion and roll out until it is about 1/8th inch thick. Cut into circles with cookie cutter. Place about 1 teaspoon desired filling towards the top of the circle. Fold over the top and two sides to form a triangle. Pinch corners together and place carefully on cookie sheet. Repeat process until all the dough has been used. Combine scraps and roll again to produce a few more hamantaschen. Before baking, seal corners by pinching them together with water. Bake 10-12 minutes or until hamantaschen are lightly browned. Cool completely before eating or freezing.